The backsplash brings out the personality of a kitchen. 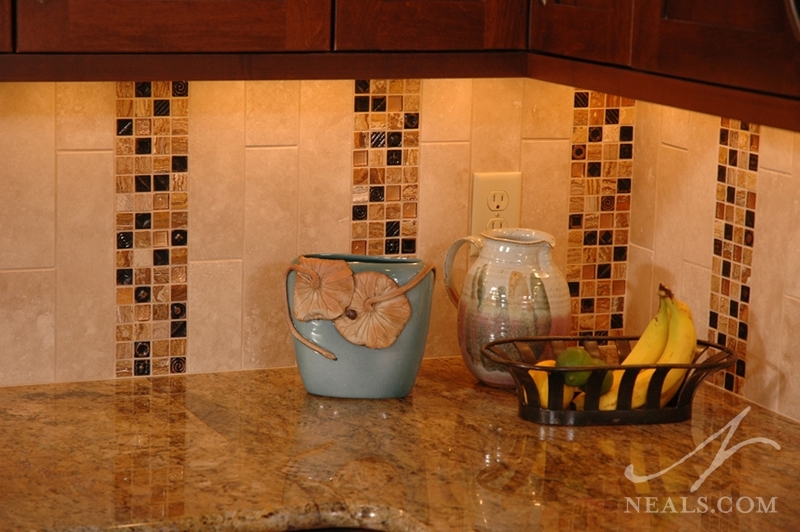 Choosing a backsplash for your kitchen is a great way to show off your style. 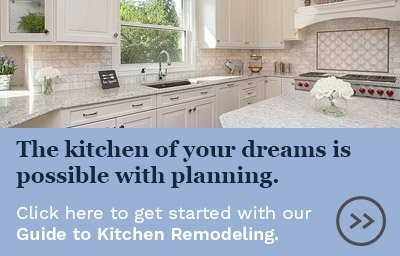 Backsplash styles and materials range from sweet and simple to elegant and elaborate to coordinate with your lifestyle. It can naturally tie a design together or become a stunning focal point. If you need help narrowing down some tile design ideas, or just with finding a place to start, keep reading. 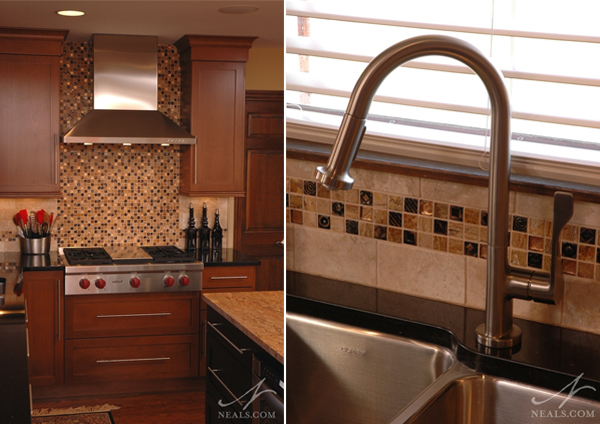 In this Neal's kitchen remodel, a colorful glass tile mixture was used to create a full backsplash. The tile compliments the colors of the natural stone countertop. When choosing the material you want to use for your backsplash, there are a few things to keep in mind. One is the design of your kitchen: the backsplash should complement the cabinets, appliances, and countertops, not compete with them. If your theme is more modern with lots of white and stainless steel, it’s important that the tile continue that theme. Subway tile has become quite popular in more modern kitchens, and glass mosaic tile continues to appear in traditional kitchens. The timelessness of the kitchen tile design you choose is also important. Make sure the pattern is one that you will still love years from now. For example, if you decide to install a design above your cooktop, you will want to make sure it is something that you won’t get tired of quickly and want to change any time soon. 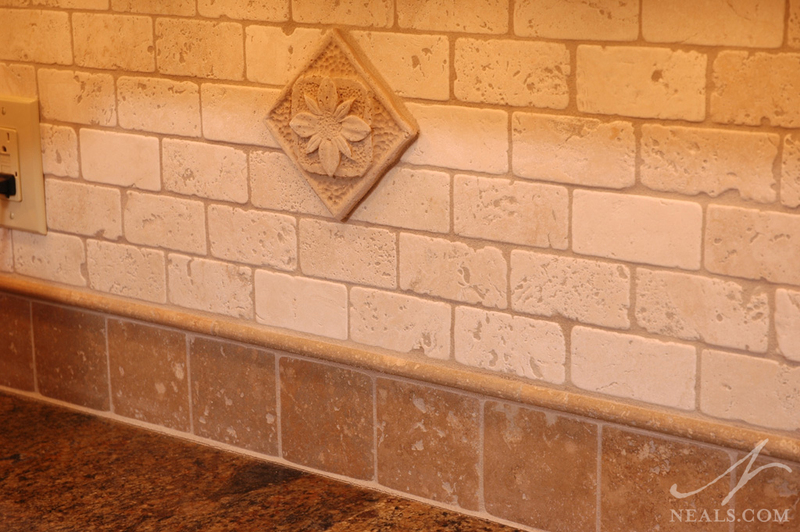 There may be more options for backsplash material than you are aware of. Tile is has been popular in the past, and remains one of the most common materials used, but materials like stone and glass are also available. Just remember that some materials are easier to maintain than others, so be sure to look into the relative up-keep commitments for any materials you are considering. Also, certain materials may be limited in colors. Ceramic, marble, glass, slate, travertine, limestone, and onyx are all materials we see in backsplashes. This country kitchen remodel used natural stone tile as a backsplash that extended to the ceiling to give the hood a chimney-like effect. The niche is styled with a different style of tiles and metalic accent pieces. How high will your backsplash reach? Will it only reach from the countertops to the bottom of the cabinet, or should it extend to the ceiling? Raising the backsplash design higher makes the room look even taller and can provide a major design impact. 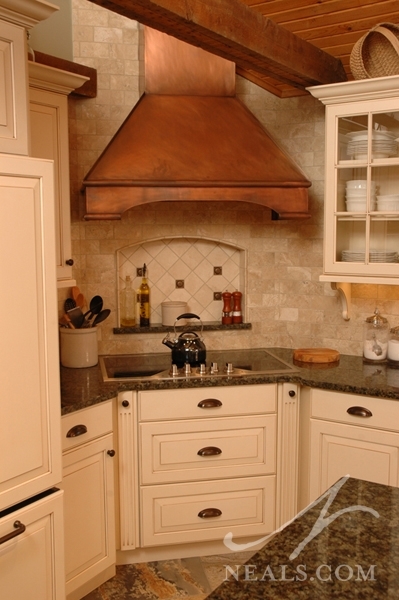 This looks especially good behind the range and around a chimney-style range hood, continuing to draw the eye upward to the ceiling. 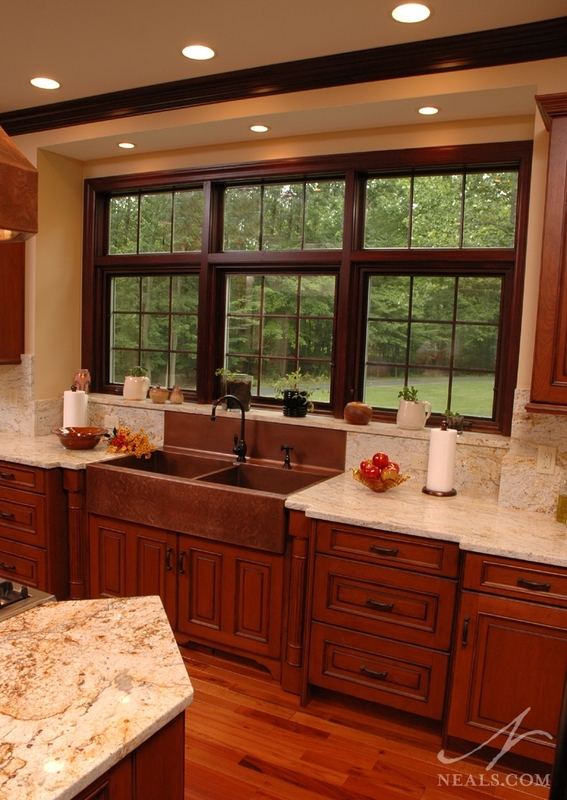 We see, particularly, higher backsplash treatments around windows and behind sinks. In this award-winning contemporary kitchen remodel, the Neal's designer created a border with the same tile used at the backsplash behind the cooktop. There are many options for creating variation in the entire backsplash by using a major element in one area, such as behind a cooktop, and carrying the theme of that element throughout the rest of the kitchen as accents or borders. In some cases, tile manufactures create these types of scheme for you to mix and match without having to worry if color and style are complimentary. 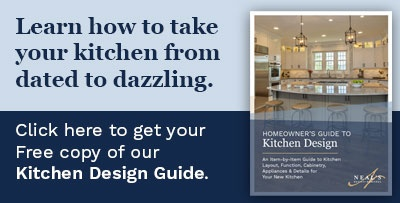 In other cases, specialty titles may be used as accents on backsplash and tied together with a matching color scheme. By turning the tiles vertically, the backsplash could be styled with a series of moasic tile stripes for a unique, modern effect. If you're leaning toward something a bit more dramatic or unconventional, look at changing the typical direction of the material. If a square tile is arranged as a diamond instead, or a rectanular tile is situated as a vertical column rather than a horizontal band, the backsplash pattern turns into something unexpected. In some projects, we've even changed the direction a a title around specific focal points to create visual interest without adding new colors or materials. Also consider under-cabinet lighting. 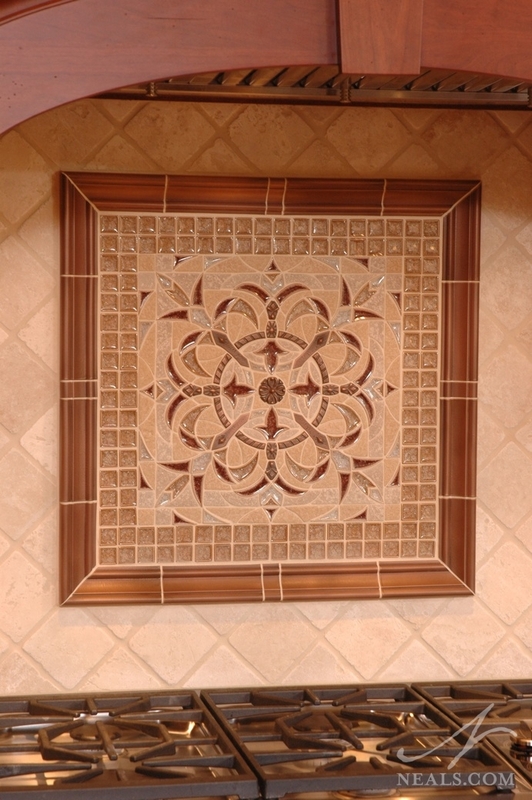 This feature enhances the beauty of any tile, helping it to stand out even more. Under-cabinet lighting especially highlights glass tiles, and make the backsplash even more of a focal point of the kitchen. Plus, it serves as an additional, useful source of light for late night or early morning navigation; even helping with food prep. Subway Tiles are a rectangular shape, inspired by tiles widely seen in subway stations. A field of subway tiles creates a timeless design that gives the room a neutral background. To spice things up, try a colored tile. Most often you will see the rectangular tiles staggered as they are stacked in a brick pattern, but stacking and lining up the columns can be just the subtle design change you’re looking for. A herringbone pattern is another great way to mix up a solid textured and colored tile. Arranging subway tiles in a Herringbone pattern feels like a modern twist without compromising the traditional nature of the tile. Natural stone was used as the backsplash material in this kitchen. The grouting process highlighted the stones natural roughness, bringing out their rustic quality. Natural Stone can be as rustic or traditional as you prefer. Stone can feel the most rustic of backsplash options, but has plenty of natural shades that can blend easily with each other and the other colors in your kitchen. Mosaic Tiles, while small (usually no larger than two square inches), allows you to get creative with the design to your backsplash tile. Mixing colors, adding a custom mural design or creating a unique pattern are all ways to use this tile in your kitchen or extend the tile use into your bathroom. In this Neal's kitchen, a Southern Ohio/KY NKBA award winner, the granite countertop was used on the wall to create the backsplash. Stone Surfaces, such as marble, granite and quartz, can be extended from the counter directly up the wall to form a solid backsplash. This is a great option when the counter material has a good color range to match your cabinetry, and can take advantage of the stone's natural movement and uniqueness. Be aware that all the limitations present in these materials as countertop surfaces still apply when they are applied as a backsplash. 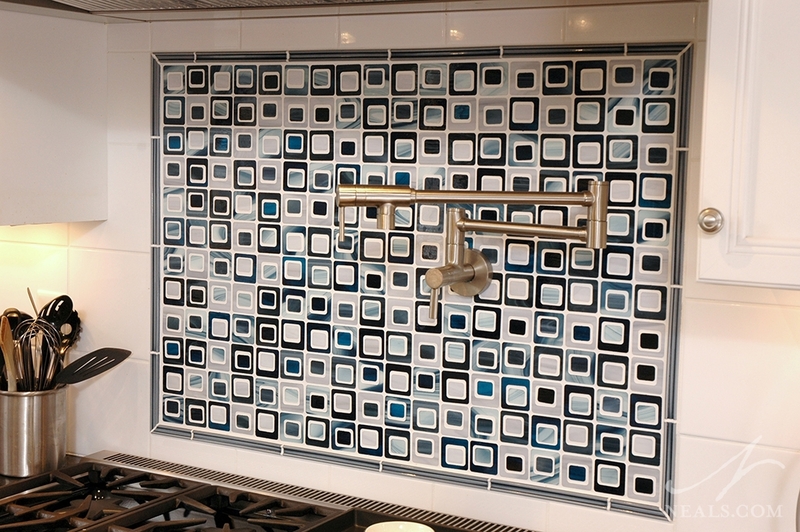 This mosaic medalion, which is available in a number of color versions, perfectly highlights the range in this kitchen. Hand-Painted or Artisan Tiles can add an element of whimsy or enhance a country or cottage aesthetic. We see these both in use as large tile panels placed behind the cooktop as well as accent tiles situated throughout the backsplash. Animals or natural depictions are a great option to display your interests and favorites, or to work with a specific theme in the kitchen. Also consider tiles that may have been picked up on vacations or travels as viable additions to your backsplash and a great way to preserve those memories. 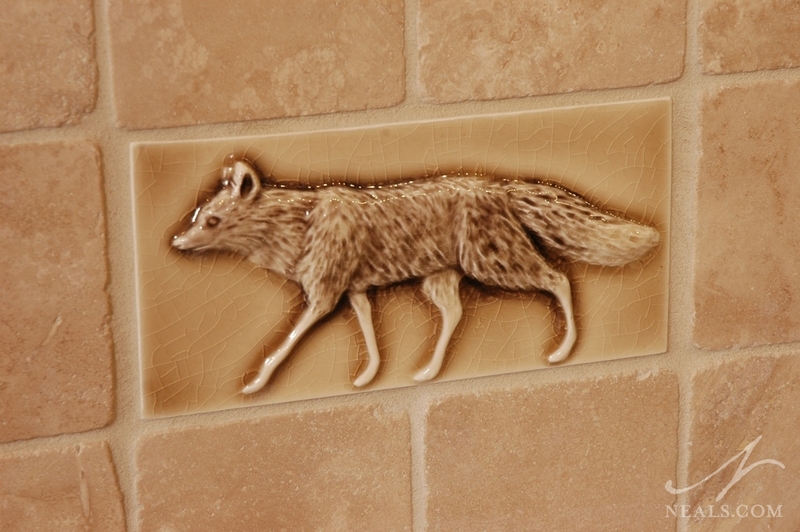 This glazed fox tile is one of a menagerie represented in this Maineville, Ohio kitchen remodel. Other tiles include a bear, rabbit, squirrel and deer - all animals native to the area. Laser Cut Tiles are a more adventurous selection for someone looking to truly customize their backsplash. Laser cut or the similar water-jet tiles create a unique style that can include different sized pieces and non-linear cuts. Because they are able to cut more precisely, the patterns produced are more elaborate than even Mosaic patterns, and can be extremely bold and stylish. This graphic backsplash was created using a laser-cutting technique to create the nesting design. 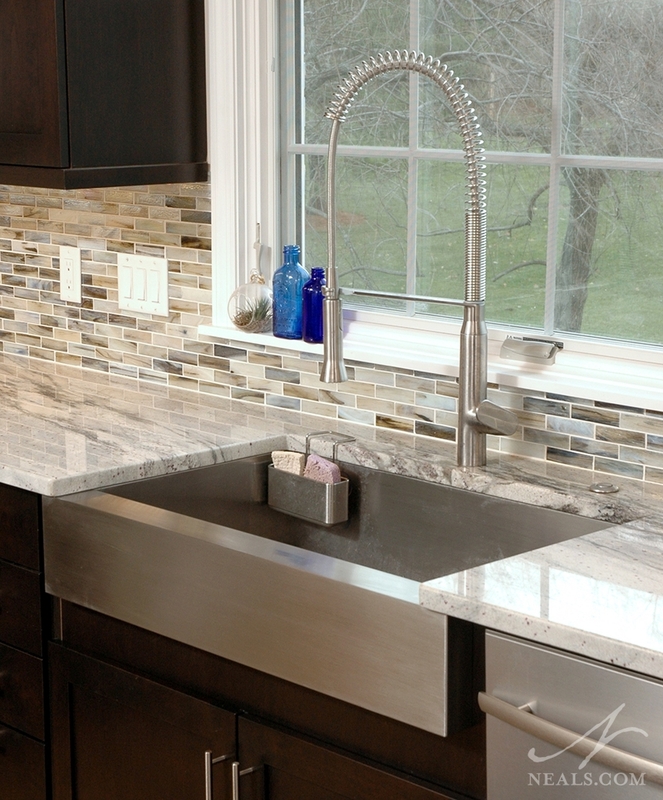 Don’t be afraid to mix two different materials together to create your perfect backsplash. Tiles and natural materials combine to display different patterns, and because there are so many options for size, color and texture, there's bound to be a combination that fits with your style. 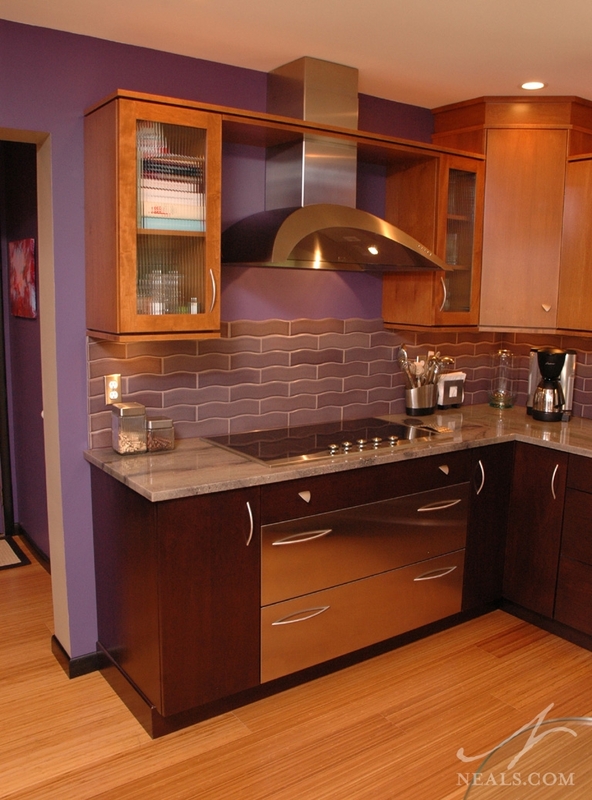 Purple tiles in a distinctive wavy pattern create a fun backsplash in this artistic Neal's remodel. Don’t be afraid of color. Use brightly colored glass tiles, or choose a pastel color for your subway tiles. This break from neutral tones liberates the space and lets it be a vibrant and thriving place for everyone.